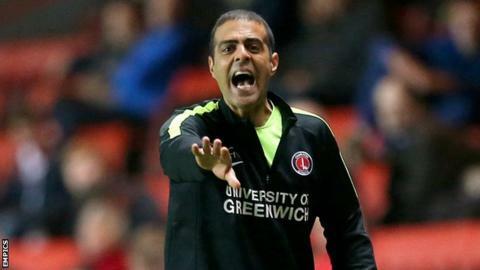 Charlton boss Guy Luzon is adamant his squad have the quality to move away from the Championship relegation zone. The Addicks are on a run of eight league games without a win and dropped into the bottom three after Tuesday's 3-0 defeat at home to Preston. "We are not a team that need to be a part of the relegation war. We are more than this," he told BBC Radio London. "I have a lot of experience in this kind of situation. In my career I have passed these obstacles." Charlton are only in the relegation zone on goals scored but the Israeli says the squad are "not happy" with their current situation. "All of us worry," the 40-year-old said. "We are aware of it and are not satisfied. We are depressed and upset like the fans and everyone around the club. "When you have 46 games you sometimes have bad periods. You have to be strong enough to pass them. "The board and the president [Roland Duchatelet] support the team, the squad and the people around the club. I am not a one-man show. We will do it." Luzon, who took charge at The Valley in January, says injuries to several key players have affected their results. Johnnie Jackson, Franck Moussa, Reza Ghoochannejhad and Simon Makienok are close to returning, while goalkeeper Stephen Henderson could soon feature for the first time this season following shoulder trouble. "The last two months have been crazy with injuries and we suffered a lot," he said. "To get results you need the tools and quality in the squad. At this point we are more positive because most of them will come back. That's a good sign for us. "When they return I'm confident we will do it. I don't let bad performance or results change my mind."